Notes: This elegant soup comes from chef Kurt Alldredge of the Vintage Room at Fess Parker's Wine Country Inn & Spa in Los Olivos, California. Combine 2 1/2 cups broth, potatoes, onion, celery, parsley, green onion, thyme, and butter in a 5- to 6-quart pan; cover and bring to a boil over high heat, stirring occasionally. Reduce heat and simmer, stirring occasionally, until potatoes mash easily with a fork, 20 to 25 minutes. Remove from heat and let cool to room temperature, about 1 hour. Meanwhile, thinly slice a fourth of the cucumber; wrap airtight and chill. Coarsely chop remaining. Working in batches, whirl potato mixture and chopped cucumber in a blender until smooth; pour into a large bowl. Stir in 3/4 cup crème fraîche, 1/2 teaspoon salt, and 1/8 teaspoon hot sauce. Cover and chill until cold, at least 1 hour, or up to 1 day. Thin soup with more broth. If desired, add more salt and hot sauce to taste. 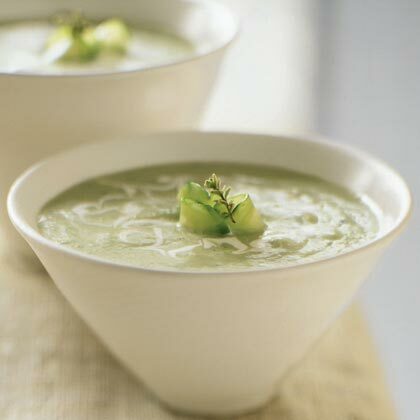 Ladle into bowls and garnish with sliced cucumber and more crème fraîche.